All information listed in this section was submitted by the respective companies. Kenilworth Media Inc. and Construction Specifications Canada (CSC) cannot assume responsibility for errors of relevance, fact or omission. 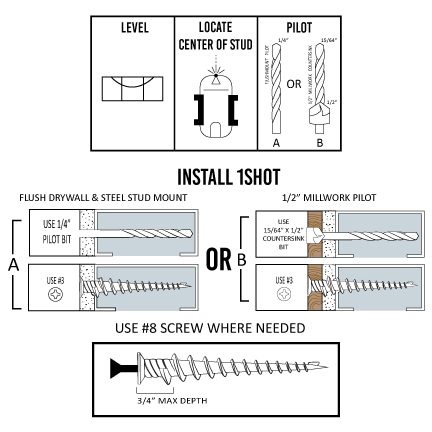 The 1SHOT Steel Stud Anchor delivers simple, reliable mounts in steel stud structures, eliminating the need for solid backing behind the drywall. The process is as easy as finding the centre of the stud, drilling a small pilot, and then installing the 1SHOT. The 1SHOT has a unique shaft profile and thread configuration. Its patented fins fold up the stud inside the wall and form a tiny ring that delivers loadbearing capabilities, making strong and secure connections to the studs. It can be applied easily with or without power tools; there is no need for complex multi-part anchors. Other features include its ability to accept smaller screws when hanging goods requiring smaller hardware (#8 wood/metal screws) threaded directly into the head of the anchor. The extended hilt and rounded top help clean up any debris left behind. The versatile configuration and design of the 1SHOT allows for endless mounting capabilities into steel studs. U.S. Patent #: US 20160003283 A1; Canadian & Global Patents Pending. Cold-formed steel framing has been a viable construction material for more than a century, but some professionals may not fully understand all the benefits of its use. One of the major advantages is maximizing the timeline of a building project and saving money—even during a harsh Canadian winter. The brick veneer/metal stud (BV/MS) backup exterior wall assembly was invented in New England in the 1970s. This type of system was formed to substitute the more expansive concrete masonry unit (CMU) backup wall because it is installed much more quickly. Now, new innovations have improved the assembly further. As more owners and design/construction professionals look toward constructing steel bridges that can last a century, it is imperative to evaluate the corrosion protection systems used to ensure these structures meet the long design life without significant deterioration, and without significant cost. With a history spanning more than a half-century in noncombustible commercial construction, cold-formed steel (CFS) is a popular material choice for framing nonstructural interior walls, loadbearing interior and exterior walls, floor joists, and curtain walls.